If you’re creating a fashion, travel or lifestyle blog using WordPress, or are just redesigning an existing website, in today’s post I’ve collected seven themes, free and premium, that can help you complete the project. As usual they come with many elements and features to create a modern and elegant blog. Check them out below! 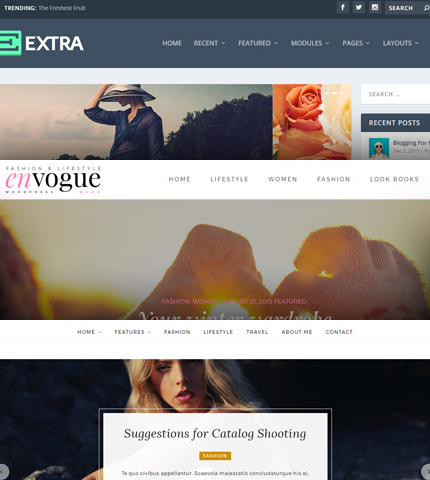 Extra by Elegant Themes is a premium theme packed with an abundance of features for fashion bloggers and it can be used for any magazine website in general. It is powered by Divi Builder, with which you can easily set up and customize every little detail of your new site. Just drag and drop everything where you want it to be and change the layout, colors, fonts and size to create a blog that best represents you. With Extra, you are able to create what you envision for your site, without having to rely solely on pre-made layouts. This alone makes this theme versatile and useful to both fashion bloggers just starting out, as well as big companies. Since content is the main focus of any blog, Extra comes with over 40 modules solely for content. You can use them throughout any pages your new blog will have and it allows you to add different media, Pricing tables, Text, Social media, Portfolio, Testimonials and much more. It is also WooCommerce ready, for you to set up shop online. Apart from that, there are several custom Widgets designed solely for bloggers, to help you connect to visitors. There are Mega Menus and Back to Top, as well as smooth navigation, for a truly professional and complete blog. Fashionista is a free theme, in a clean and minimalist design. It is a great beginner theme, for those just starting out in the online fashion world. This is a responsive theme on any device and you can view any customization you make to your website in real-time, by using the WordPress Customizer. You can add as many pages and categories as needed, while being able to upload pictures and post about your latest adventures in a simple and clean-cut look. There are widgets for social media, a comment section and archive and gallery options. You can use it for a fashion blog like this for example, for a travel blog, lifestyle blog and more. Sølvi by Bahemian is a premium theme for bloggers who value finesse and elegance in the way they present themselves to the world. This is a simplistic theme, with only the necessary features you need, in order to keep things clean and simple. Nonetheless, it is versatile and flexible, which allows you to create the website you want, with no limitations. It comes with 6 color styles (Pink, Light, Turquoise, Orange, Brown and Dark) and 6 Frontpage Slideshow Layouts to help you get started. For blog posts, there are also 6 options for the style so you can vary the look of each post. You can add text, media, audio, video, create slideshows or just a gallery of your favorite photos. This is a RTL supported, Translation ready and fully responsive theme, with over 800 Google fonts and Widgets for social media. Everything can be customized using the WordPress Customizer and it is also Child theme ready. Also a premium theme, EnVogue is a fashionista’s dream theme. It is created by CMS SuperHeroes and it is one of the most stylish themes you will come across. There are over 500 elegant Google fonts to choose from, so you will not have to rely on the same old fonts. The AJAX Live Search feature is a great way for visitors to quickly find what they are looking for and it uses Sticky Navigation. There are 5 Layout options for your blog and you can easily create and customize as many pages as you will need. You can add all the photos you take on your adventures and make use of the 3 Promotional feature boxes. Creating a Look Book has never been this easy and the Animated Article transition will capture the readers’ attention and make them truly enjoy your work. Choose from unlimited color options and get ready to make your big debut to the online world. Next there is Point, a free WP theme that has numerous features and is created by MyThemeShop. There are unlimited color options and background patterns, while the layout is clean and simple, placing the focus on the content. Point is translation-ready and comes with custom widgets, to help you get started without any fuss. You can customize this theme to suit your needs without having to work with code. The WordPress Customizer will help you do all that in no time. Another great feature is the Related Post, as it will suggest to readers what they should read next on your blog, based on their preferences. Being visitor-friendly is what Point is all about. Moving on to Black Pearl, this premium theme by PixFlow is unique and modern. It comes with a powerful Control Panel, which gives you complete control over any aspect of the theme and your website. There is also a Shortcode Generator, to make everything easily accessible. There are 14 predefined color styles, separated into two categories: Dark and Light. It comes with 11 custom widgets and 2 portfolio styles, to beautifully showcase your photography and artistic skills. There are also 16 animated social icons and it comes with numerous Google fonts. Black Pearl is fully responsive and comes with both Awesome Slider and Touch Slider. PixFlow also created Custom responsive Touch Sliders, for those visiting the site from smartphones and tablets. This theme is Translation-ready and comes with a 12 columns grid system and unlimited custom sidebars. Created by RainThemes, Rylo is a premium theme in an elegant and minimalist design. It is fully responsive on any device and comes with Two Menus, with unlimited Drop-Down menu options. There are 5 Blog Listing layouts and 4 Post formats, including text and different media, such as video, images and audio. You can customize and place Ads in the specified Ad area and make use of the posts listing area, which showcases recent or popular posts from a category. There is support for 17 different social medias along with custom widgets. When it comes to post design and fonts, there are more than 800 Google Fonts, as well as numerous Typography settings. The majority of the features are customizable and it is a Translation-ready theme. Apart from all that, it is also compatible with MailChimp, for creating newsletters and connecting with your readers.